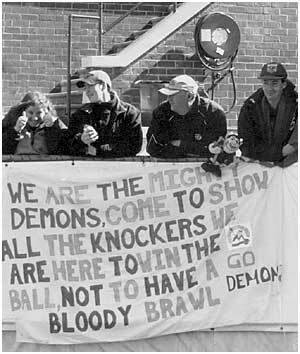 The images of the North Hobart Football Club were the basis of my Honours submission for the Bachelor of Fine Art in 2003. The idea began as I was moving into a new house just down the road from the North Hobart Oval early in the year. Wellington Street is a mix of old residential dwellings such as my own, and small business. The street is jammed with people during the day going about their personal and professional lives, as they have been doing in this area for generations. My work has always drawn me into personal contact with the lives of others. I saw in the North Hobart Football Club another opportunity to investigate something of the community I was moving into. Aussie Rules has long been the subject of myth and myth-making, becoming one with our collective Australian identity. The club, however, exists far from the hype and glare of the much publicised AFL. Like many small suburban football clubs it has struggled to maintain itself. The club's existence rests on its community of faithful supporters, and volunteers like the canteen ladies. With their keen eye and sharp wit, they are in the best position to survey the game from their position up on the hill. Their attention wavers between your order and the game. Their faces display anticipation, excitement, frustration, and occasional disappointment. They express the same emotions as many others around the field. The frequent remarks to umpires are mixed with calls to opponent players. The game is a unique arena for individual emotional expression. The same supporters turn up week after week in support of their boys. One of those supporters is Rosemary who follows the team to every game, home and away, without fail every Saturday during the season. She is often seen standing alone intently taking down notes. The club is not only a loose group of individuals, but also a community strongly oriented towards family. Longtime family names such as Devine and De Venuto continue to be seen playing for their beloved team. The locations for these photographs have drifted from the grassy slopes of the New Norfolk Oval to the concrete perimeters of the North Hobart Football ground, where the home side set themselves up to eventually win the 2003 Grand Final over Hobart by 110 points. My images have concerned themselves with what happens on the perimeter, the quiet moments which reveal a common human interest, but which are uniquely place in our local football culture. Adam is contemplating new subjects for his next assignment. Suggest a topic by clicking here to email him.